In the latest round of food recalls, fortunately, things have been pretty mild. While the romaine lettuce E. coli outbreak earlier this year did claim a casualty, and there have been many salmonella cases tied to Honey Smacks, the latest voluntary recall tied to whey powder is merely a precautionary measure. So Kraft Heinz’s recent pull of Taco Bell Queso Dip from grocery shelves lands a bit hard, even though, so far, it’s precautionary: CNN reports that “an estimated 7,000 cases of Taco Bell Salsa Con Queso Mild Cheese Dip are being recalled because there are signs of product separation that could lead to botulism, the U.S. Food and Drug Administration said Tuesday.” Botulism, CNN points out, is a rare form of life-threatening food poisoning. If you have some of the queso dip at home, you’ll want to specifically get rid of any 15-ounce glass jars with “best when used by” dates between December 27, 2018, and January 23, 2019. 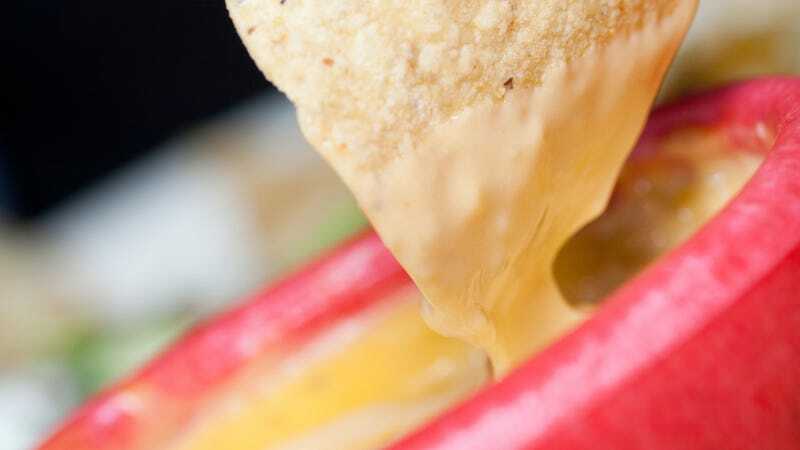 “Kraft Heinz recommends that buyers not eat the product, even if it does not appear spoiled,” so sorry, queso lovers: Just throw that jar away. Or return it to the store for a refund; you can also call Kraft Heinz at 1-800-310-3704 with any health or refund questions. What do $180 tacos get you?